More recently, when a restaurant in Tyler was concerned about the slow processing of its liquor permit, members of Bonnen’s beer-distributing family sought assistance on its behalf — and soon the Angleton lawmaker’s office asked state regulators what was taking so long. Now that the bank CEO has risen to one of the highest offices in state government — speaker of the Texas House — his financial ties to lobbyists and the permit "status check" he provided at the request of his wife’s family highlight two potentially fraught areas for the new GOP leader, particularly during a legislative session in which alcohol laws could undergo major revision. Bonnen told The Texas Tribune he sees no conflicts of interest, no reason to take any formal steps to distance himself from beer or banking issues, and no need to tighten disclosure rules that make it impossible for Texans to know for sure which lobbyists have invested in his Heritage Bank of Pearland — a list that is much larger than what has previously been reported. “We’re a citizen legislature, and what our constitution and what the people of Texas have wanted for over a hundred years is people to be elected, come to Austin for a short period of time, and live and work under the laws that we pass,” Bonnen said in an interview at the Capitol last week. But ethics watchdogs say that at a minimum, Bonnen should disclose the full list of lobbyists and Texas lawmakers who invested in Heritage while taking clear steps to distance himself from any legislative issues that could conflict with any personal or family business. 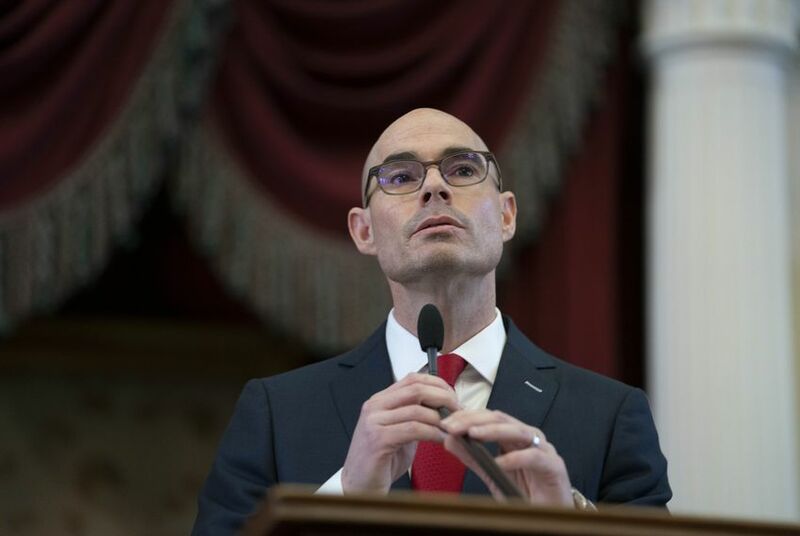 Bonnen already has instructed his staff to remain “neutral” on alcohol issues this session, when reformers pushing free-market reforms are expected to do battle with wealthy beer distributors who benefit from the status quo. But the new speaker sees no reason to do what his predecessor did on horse-racing issues. Before each session, former GOP Speaker Joe Straus, whose family has horse-racing interests, recused himself in writing from any actions related to expanding gambling at horse tracks. As a state representative and now as speaker, Bonnen said he sees no problem trying to help any “citizen” facing liquor permit issues — even if that involves R & K Distributors of Longview, the beer distributing company partly owned by his wife, Kimberly Bonnen, (via a trust) and run by her father and brother. Bonnen said his father-in-law, Mike Martin, CEO of R & K Distributors, asked Bonnen's wife if Bonnen could determine whether Aspen Creek Grill's mixed beverages license would "show up sooner [rather] than later.” After Bonnen's office inquired about the status of the permit in a December 2016 email to the Texas Alcoholic Beverage Commission, the agency's government relations director said she had "been pushing" and would "push some more." That day, the TABC issued a "letter of authority" that allowed Aspen Creek Grill to sell alcohol. (A managing partner at the restaurant confirmed that R & K distributes beer to the eatery). 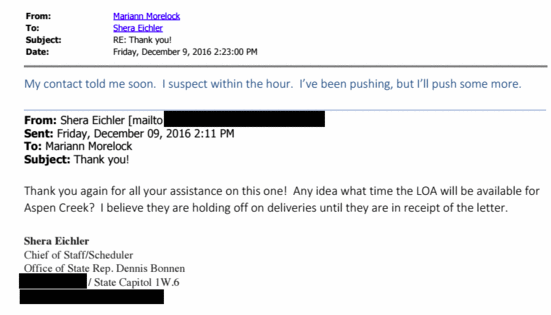 A 2016 email shows discussion with a Texas Alcoholic Beverage Commission government relations manager about the liquor permit for Aspen Creek Grill in Tyler. In 2008 or 2009 — he can’t remember which — Bonnen says he made an investment presentation for his new bank to a crowd that included several lobbyists in a meeting at the downtown Austin office of top-tier lobbyist Rusty Kelley. Bonnen said Kelley assembled the meeting, which was one of numerous weekly presentations Bonnen was making to various investors at the time. While Bonnen discloses that he has “business in common with a lobbyist” at Heritage Bank on mandatory state ethics filings, state ethics laws allow him — and any other Texas lawmaker — to keep secret the names of the lobbyists. In an interview, he declined to say which registered lobbyists have a stake in his bank but noted that no single shareholder owns more than 4 percent of the company’s stock. “I think you ought to disclose who the hell they are, and you may want to take steps to recuse yourself from any activities involved with it,” said Dave Jones, president of Clean Elections Texas, a nonpartisan group dedicated to campaign finance and ethics reform. Massingill, who accompanied Bonnen to the Tribune interview at the Capitol, replied, “I’m not going to answer that,” when asked if he had invested in Heritage Bank. Massingill said he had sold his interest in his old lobby firm, Carriage House Partners LLC. But Massingill remains partners with two other Carriage House lobbyists, Mathis and James Clark, in the property where Carriage House has its offices just west of the Texas Capitol. Massingill, Clark and Mathis all shared a roof there until mid-November, when Massingill was tapped to become Bonnen's chief of staff. The Carriage House, which has a private bar that's known as a popular after-hours destination for lawmakers and lobbyists alike, was expanded thanks to a $1.4 million loan from Heritage Bank in 2015. Bonnen said the loan represented .004 percent of his bank’s $241 million loan portfolio and is precisely the type of business he likes to do. “Community banking is about making loans to relationships you have,” Bonnen said. “We … competed and gave them a good rate." Lobbyists aren’t Bonnen’s only Capitol friends with a stake in Heritage Bank. Former House Speaker Tom Craddick, R-Midland, who under Bonnen got his first committee chairmanship in years, has a piece of it. So does state Rep. Dan Flynn, R-Canton, who sits on the Heritage Bank board and was tapped by Bonnen to head the Defense and Veterans Affairs panel. Bonnen’s brother, Rep. Greg Bonnen, R-Friendswood, is a major shareholder. Disclosure: Rusty Kelley, Jack Roberts, Gavin Massingill and Sabrina Brown have been financial supporters of The Texas Tribune, a nonprofit, nonpartisan news organization that is funded in part by donations from members, foundations and corporate sponsors. Financial supporters play no role in the Tribune's journalism. Find a complete list of them here.